Continuous innovation, robust functionality, automation, mobile and engaging UX, and low-cost updates. Does PeopleSoft come to mind? Well, it should—PeopleSoft has quietly re-emerged as the “new” modern ERP platform. With this four-part webinar series, Sierra-Cedar’s PeopleSoft Playbook, PeopleSoft customers have the opportunity to learn about the untapped potential within their existing ERP systems as they contemplate alternative paths for the future. By providing insights for developing Winning Strategies, we address today’s most pressing PeopleSoft questions: What is the “New PeopleSoft Value Proposition”? How do we win with PeopleSoft in the Cloud? And how do optimal Integration approaches change in the new PeopleSoft world? It’s a game changer! 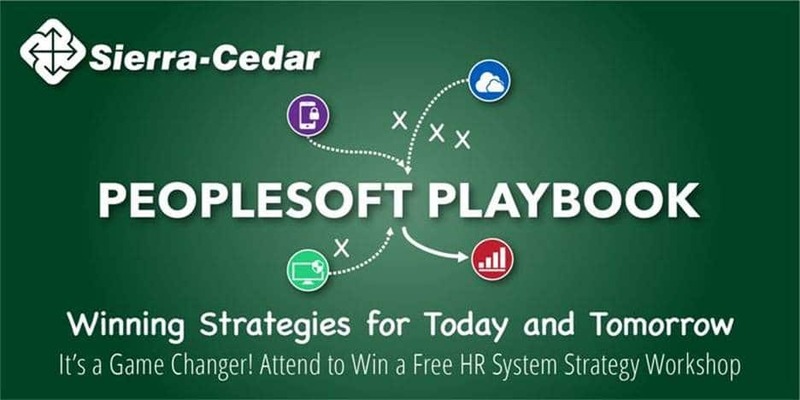 Attend Sierra-Cedar’s PeopleSoft Playbook webinars and be entered to win a FREE, HALF-DAY WORKSHOP with Sierra-Cedar Research. We invite you share your experiences, ask questions, and learn how new advances will transform the way you look at PeopleSoft in the future. Thank you for joining our Playbook series! Join us for the second half kickoff of our series—visit us to learn more and register for 3 and 4! In today’s Cloud-focused world, how does PeopleSoft remain a worldwide leader in enterprise application software? Here’s how: Oracle continues to invest in innovative and adaptive features that engage your people, solve business challenges, and are designed to lower your TCO. Top performing organizations that realize these PeopleSoft advancements benefit from user satisfaction and financial performance. Richard George, VP of Strategic Services & Alliances, will focus on how PeopleSoft continuously delivers a modern, mobile application that is responsive, agile, and offers many of today’s service delivery advancements at a reasonable cost. He’ll then reveal how leading organizations are capitalizing on this new PeopleSoft value proposition.